ST. PETERSBURG – Activists from across Russian, Ukraine and Belarus turned out in force in urban centers across the former Soviet republics over the weekend to hold ceremonies commemorating 22nd anniversary of the Chernobyl disaster and express outrage at Russia’s current nuclear plans. The transnational days of remembrance not only offered victims of the catastrophe a chance to look back on two decades of nuclear contamination, but demand changes to the continuing activities of Rosatom, Russia’s state nuclear corporation, that are setting the stage for more contamination and disasters. It was the first such group of demonstrations in recent memory that has made such a clear link between the tragic accident in 1986 and anti-nuclear sentiment toward nuclear projects being realised in the present. It also comes at a time when anti-nuclear protests are on the rise as cities across Russia see more and more people turning out to protest local nuclear grievances. According to recent polls conducted by the Romir polling agency, in cooperation with Bellona and Ecodefence, nearly 80 percent of Russians are against the new nuclear construction announced by the government and slated to take place before 2020. Vast areas within and beyond Soviet borders were contaminated by the radioactive cloud that spread in the wake of the explosion of the Chernobyl nuclear power plant’s fourth reactor. The disaster was caused by overheating following an experiment involving fuel rods, which was ironically aimed at improving safety. Of one small consolation to Chernobyl protesters and victims was the fact that construction of an enormous steel barrier to hold radiation still leaking from the site of the exploded reactor unit 4 will be going up over the hastily constructed and cracking cement sarcophagus that was assembled in the immediate aftermath of the accident. "Today we remember the events of 1986, the Chernobyl tragedy (…) We must always remember the heroism shown by those that took part in the liquidation of the accident and its consequences," Boris Gryzlov, Speaker of Russia’s Duma told reporters. 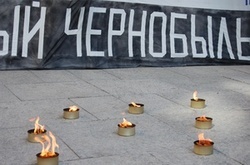 In Central St. Petersburg, a protest on Saturday arranged by Bellona and Ecodefence marked the anniversary of world’s worst nuclear accident, and gave activists a springboard to demand a cessation to plans to build a second power plant near the city – the so-called Leningrad Nuclear Power Plant 2 (LNPP 2) that Rosatom wants to build near the first aged LNPP. In Murmansk, environmentalists led by the group Nature and Youth, turned out under the banner of Chernobyl to demand that the local Kola Nuclear Power Plant, which has received permission to extend the engineered lifespan of one of its old reactors, cease operations. Protestors in Minsk – the capitol of Belarus, which hardest hit by Chernobyl’s fallout – angry marchers said the government was denying help to people affected by the disaster, including those who were sent in to clean up radioactive fallout. “We don’t want a repeat of the Chernobyl catastrophe, so we stand against the construction of a new Leningrad power plant near St. Petersburg, and illegal engineering life span extensions for existing nuclear power plants ” said Rashid Alimov, editor of Bellona Web’s Russian-language pages at Saturday’s demonstration. As protestors from the environmental union Chernobyl and the Kaliningrad branch of Ecodefence held a press conference stating their opposition to the new planned nuclear plant, Rosatom was engaged in its own PR campaign to convince Kaliningrad that a new nuclear plant was exactly the lifeblood the territory needed. Statistics about illness in the contaminated parts of Belarus — about 23 percent of its territory — are kept under wraps by the government. Protesters said the government was denying help to people affected by the disaster, including those who were sent in to clean up radioactive fallout. University graduates who meanwhile refuse to relocate to work in the contaminated zone are threatened by being stripped of their university degrees and being forced to reimburse the cost of their education to the state. Belarus Deputy Prime Minister Alexander Kosinets defended the assignment of university graduates to work in the contaminated zone by saying that if the work assignments were canceled, the region would be left without the doctors, teachers and other specialists it needs, RIA Novosti Russian newswire reported. In Kiev, Ukraine, church services were held in commemoration of the disaster and Ukraine President Viktor Yushchenko took part in a ceremony to lay flowers at the memorial to Chernobyl Heroes in Kiev. For the anniversary, former residents of the 30-km restricted zone surrounding the plant have been allowed to re-visit the area, where abandoned ghost towns lie almost untouched since Soviet times. More than 300,000 people were relocated as a result of the explosion. Some 5 million people live in areas of Belarus, Russia and Ukraine classified as "contaminated" by radioactive elements. In the immediate aftermath of the explosion, an enormous cement sarcophagus was dumped on the smoldering remains of Chernobyl’s fourth reactor, where fires continue to burn. Bellona, which has visited the site numerous times, has determined that the sarcophagus is leaking radiation. To counteract this, the European Bank of Reconstruction and Development has put in place $1.4 billion in aid to erect an immense steel shell over the sarcophagus, which the EBRD’s nuclear safety director, Vince Novak, says will make Chernobyl safe. Despite Yushchenko’s solemn participation in the wreath laying ceremony, he has often said that he wants to expand Ukraine’s nuclear power potential – which brings the jeers of environmentalists. “Nuclear energy has shown how expensive it is,” said Vladimir Chuprov of Greenpeace Russia. Rashid Alimov reported from St. Petersburg, Anna Kireeva reported from Murmansk, Galina Raguzina reported from Kaliningrad, and Charles Digges wrote and reported from Oslo.